Have you watched “White Christmas” (1954) recently? It’s a classic for a number of reasons — e.g., it was the first movie filmed in VistaVision — but something that caught my attention recently was the way the film plays with artifice. 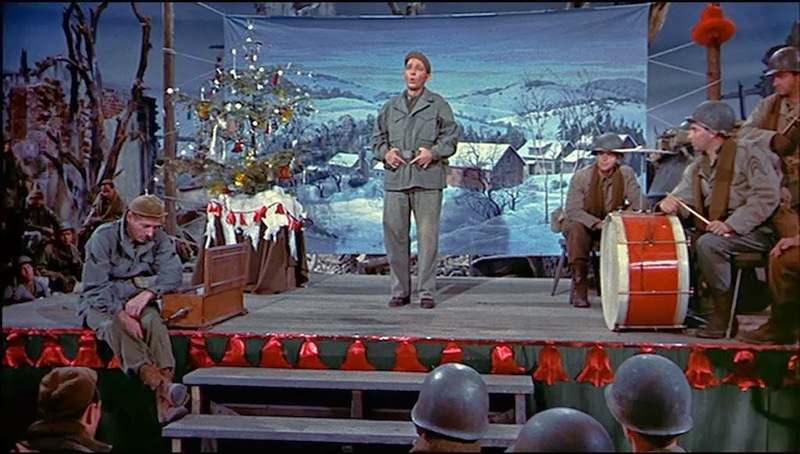 The opening scene (pictured above), set on Christmas eve among US troops fighting in Europe during World War II, features an impromptu show put on by the soldiers, featuring Cpt. Bob Wallace (himself a famous entertainer before enlisting, played by Bing Crosby) and Private Phil Davis (played by Danny Kaye). Behind them hangs a tarp with a classic wintery scene painted on it, sprucing up the otherwise bombed-out setting. As the two dance, the camera pans back slowly, over the crowd, to establish the opening shot. Jump ahead to the conclusion of the film — spoilers — and the soldiers all reunite after the war, now in their freshly pressed dress uniforms and with their families in tow, to honor their onetime General with a surprise party, held at his struggling inn in snowless Vermont, once again on Christmas eve. But then the snow begins, just as the show ends, and, to bookend the story, the camera again pans back, and we close by reproducing the opening scene but without the tarp. And in between there’s all the mix-ups and misdirections that we’ve come to expect from a romantic comedy, e.g., the boys, now a much-loved singing duo, scout a new act, the Haynes sisters and, eventually, Phil and Judy (played by Vera-Ellen) pretend to get engaged to try to persuade her motherly sister, Betty (Rosemary Clooney — yes, George’s aunt), to take the plunge with Bob. Lots of white lies are told to keep the General out the loop for the big surprise, resulting in confusion, misunderstandings, some hard feelings, and, eventually, make-up smooching behind the Christmas tree onstage, midway through the big show. Early on, in one of the movie’s many famous numbers, the boys even roll up their pants, display their garters, and lip-synch to the girls’ record — after the ladies performed this very act themselves — to buy the gals some time so they can get away from the local sheriff. For those of us interested in strategic yet playful acts of identification, this film can be pretty useful — if, that is, you can look beyond it’s nostalgic charm or, perhaps, familiarity. For while obviously being a movie itself, in which constructed sets frame and establish moods that hardly exist off stage, beyond the edge’s of the tarp, within the film itself the director, Michael Curtz (who also directed “Casablanca” ), frames the entire story within the context of the real/fake opposition (for instance, during the war Bob was already a real performer and Phil was just a hopeful wannabe), not to mention playing throughout with how we conceive of past/present (“Just like the ones we used to know….” goes the famous lyric), male/female, commercial/non-commercial (will the boys benefit financially from the surprise show? ), single/married, as well turning notions of rank upside down (e.g., the former General as lowly inn-keeper/servant — a loss of status that generates much anxiety for all concerned, which is the driving force of the plot). How Curtz manages to then produce some real emotions in viewers of his film, even 60 years after it was first released, all by manipulating, right in front of our noses, notions of real and fake, is therefore the curious thing (that Irving Berlin, who wrote the music and lyrics, was Jewish is no less fascinating, of course); for right from the start that painted tarp tells us, in no uncertain terms, that something is being faked (like Phil nursing his war wound for years after, manipulating Bob by means of it) and no doubt, on some level, we realize at the end that we’re still viewing a Hollywood set, which is no more real than the opening scene, and, yes, we know that there’s a crew sprinkling down soap flakes “outside” (i.e., not really outside), just beyond the Christmas tree — snow that’s no more real than the white napkin they used earlier in their diorama while signing on the train, on their way to what, despite their hopes, turns out to be disappointingly green Vermont (which, of course, means green mountain, in French). So despite all the singing and wishing, there’s no snow anywhere in the movie. And we all know that, like any archetypical holiday, it’s only in our dreams. But, for many, annually (maybe even repeatedly) watching this movie is an important element in creating their cherished idea of a white Christmas — demonstrating that fakery and sincerity are intermingled, all the way down. May your days be merry and bright…. Previous PostPrevious Going to the Talkies?